"Game Vault" Deer Coolers is a small Texas based company that markets walk-in coolers, freezers, refrigeration, meat rail systems and related products. We offer a complete line standard and "custom" size coolers for ranch and hunting use. "Trolley" style meat rails systems are also available. We will work with you to design and layout an easy and efficient rail system to handle your harvested animals. With a “Trolley System” one man can easily handle deer, hogs, exotics, and even “Nalgai” Our walk-in cooler panels carry a 10 year warranty. The insulated panels are the most energy efficient available and are compliant with the “USDA” as well as, all local, state and national health codes. 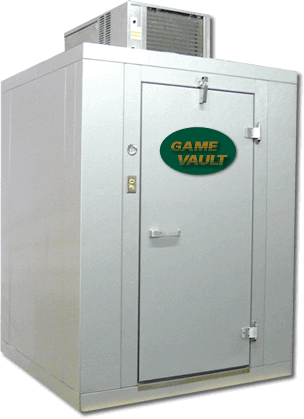 “Game Vault” Deer coolers can be purchased with or without an insulated floor. They are also available in any size to meet your game and deer storage needs. Delivery and assembly is also available. Deer & Game Walk-in Cooler Specs.